In my years in software development, I have experienced many projects that have encountered challenges on keeping with its schedule and meeting its deadline. One major reason would be the constant change of requirements. The clients or users are not sure what they want. They have difficulty stating all they want and know. Many details of what they want will only be revealed during development. The details are overwhelmingly complex for people. As they see the product develop, they change their minds. External forces (such as a competitor’s product or service) lead to changes or enhancements in requests. Luckily there were a group of experts in the industry who created a revolutionary way to do software development. This revolutionary methodology they have called as “Agile”. Agile development methods apply timeboxed iterative and evolutionary development, adaptive planning, promote evolutionary delivery, and include other values and practices that encourage agility—rapid and flexible response to change. If agile methods have a motto, it is embrace change. If agile methods have a strategic point, it is maneuverability. There is much to learn with regards to Agile and how to implement it. And this post is not meant to be a comprehensive guide in learning agile but an introductory note that there is already an existing method that would solve the common problem of changing requirements in software development. Today when I encounter requirement change in a project, I do not complain anymore. I instead adapt to it. Now is the time to Adapt to the changing world! Start being Agile! The Single Responsibility Principle is about actors and high level architecture. The Open/Closed Principle is about class design and feature extensions. The Liskov Substitution Principle is about subtyping and inheritance. The Interface Segregation Principle (ISP) is about business logic to clients communication. In all modular applications there must be some kind of interface that the client can rely on. These may be actual Interface typed entities or other classic objects implementing design patterns like Facades. It doesn’t matter which solution is used. It always has the same scope: to communicate to the client code on how to use the module. These interfaces can reside between different modules in the same application or project, or between one project as a third party library serving another project. Again, it doesn’t matter. Communication is communication and clients are clients, regardless of the actual individuals writing the code. So, how should we define these interfaces? We could think about our module and expose all the functionalities we want it to offer. 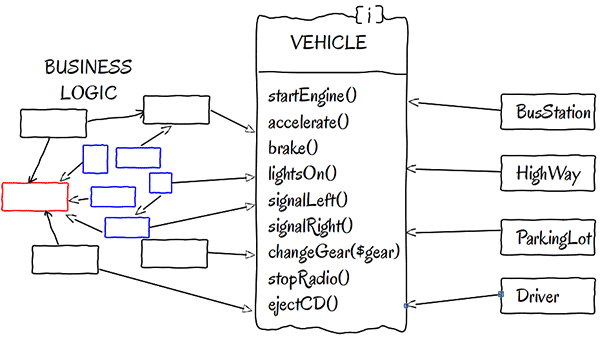 A huge Car or Bus class implementing all the methods on the Vehicle interface. Only the sheer dimensions of such classes should tell us to avoid them at all costs. Or, many small classes like LightsControl, SpeedControl, or RadioCD which are all implementing the whole interface but actually providing something useful only for the parts they implement. It is obvious that neither solution is acceptable to implement our business logic. We could take another approach. Break the interface into pieces, specialized to each implementation. This would help to use small classes that care about their own interface. 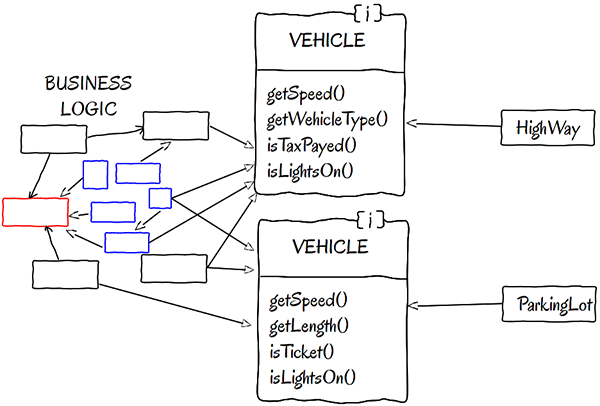 The objects implementing the interfaces will be used by the different type of vehicles, like car in the image above. 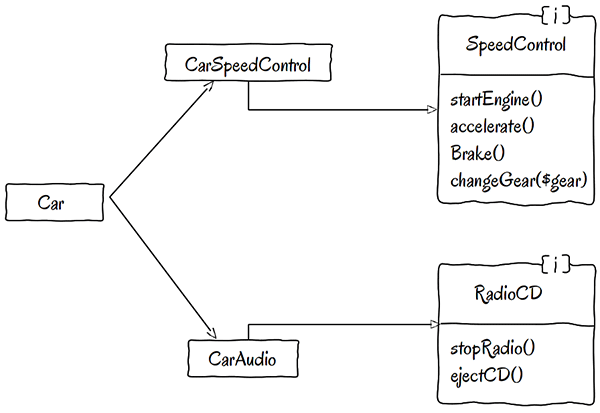 The car will use the implementations but will depend on the interfaces. 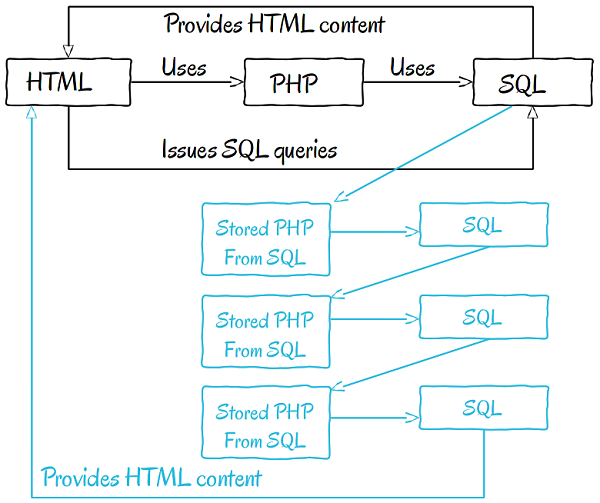 So a schema like the one below may be even more expressive. But this fundamentally changes our perception of the architecture. The Car becomes the client instead of the implementation. We still want to provide to our clients ways to use our whole module, that being a type of vehicle. Assume we solved the implementation problem and we have a stable business logic. The easiest thing to do is to provide a single interface with all the implementations and let the clients, in our case BusStation, HighWay, Driver and so on, to use whatever thew want from the interface’s implementation. Basically, this shifts the behavior selection responsibility to the clients. You can find this kind of solution in many older applications. The interface-segregation principle (ISP) states that no client should be forced to depend on methods it does not use. However, this solution has its problems. Now all the clients depend on all the methods. Why should a BusStation depend on the state of lights of the bus, or on the radio channels selected by the driver? It should not. But what if it does? Does it matter? Well, if we think about the Single Responsibility Principle, it is a sister concept to this one. If BusStation depends on many individual implementations, not even used by it, it may require changes if any of the individual small implementations change. This is especially true for compiled languages, but we can still see the effect of the LightControl change impacting BusStation. These things should never happen. Interfaces belong to their clients and not to the implementations. Thus, we should always design them in a way to best suite our clients. Some times we can, some times we can not exactly know our clients. But when we can, we should break our interfaces in many smaller ones, so they better satisfy the exact needs of our clients. Of course, this will lead to some degree of duplication. But remember! Interfaces are just plain function name definitions. There is no implementation of any kind of logic in them. So the duplications is small and manageable. Then, we have the great advantage of clients depending only and only on what they actually need and use. In some cases, clients may use and need several interfaces, that is OK, as long as they use all the methods from all the interfaces they depend on. Another nice trick is that in our business logic, a single class can implement several interfaces if needed. So we can provide a single implementation for all the common methods between the interfaces. The segregated interfaces will also force us to think of our code more from the client’s point of view, which will in turn lead to loose coupling and easy testing. So, not only have we made our code better to our clients, we also made it easier for ourselves to understand, test and implement. ISP teaches us to respect our clients more than we thought necessary. Respecting their needs will make our code better and our lives as programmers easier. Child classes should never break the parent class’ type definitions. Let q(x) be a property provable about objects x of type T. Then q(y) should be provable for objects y of type S where S is a subtype of T.
Later on, with the publication of the SOLID principles by Robert C. Martin in his book Agile Software Development, Principles, Patterns, and Practices and then republished in the C# version of the book Agile Principles, Patterns, and Practices in C#, the definition became known as the Liskov Substitution Principle. As simple as that, a subclass should override the parent class’ methods in a way that does not break functionality from a client’s point of view. Here is a simple example to demonstrate the concept. A client class should be able to use either of them, if it can use Vehicle. 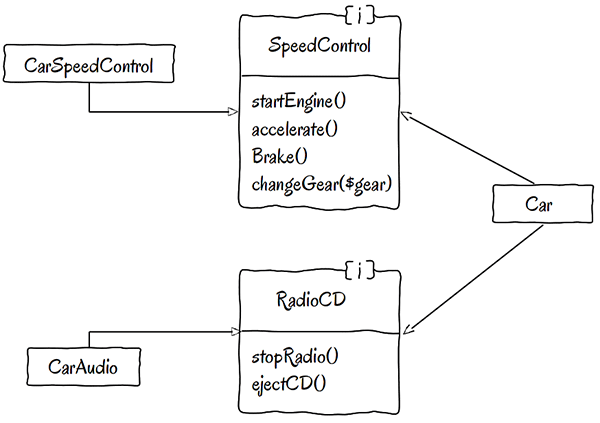 Which leads us to a simple implementation of the Template Method Design Pattern as we used it in the OCP tutorial. Based on our previous experience with the Open/Closed Principle, we can conclude that Liskov’s Substitution Principle is in strong relation with OCP. In fact, “a violation of LSP is a latent violation of OCP” (Robert C. Martin), and the Template Method Design Pattern is a classic example of respecting and implementing LSP, which in turn is one of the solutions to respect OCP also. To illustrate this completely, we will go with a classic example because it is highly significant and easily understandable. We start with a basic geometrical shape, a Rectangle. It is just a simple data object with setters and getters for width and height. Imagine that our application is working and it is already deployed to several clients. Now they need a new feature. They need to be able to manipulate squares. In real life, in geometry, a square is a particular form of rectangle. So we could try to implement a Square class that extends a Rectangle class. It is frequently said that a child class is a parent class, and this expression also conforms to LSP, at least at first sight. 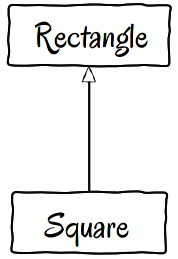 But is a Square really a Rectangle in programming? A square is a rectangle with equal width and height, and we could do a strange implementation like in the above example. We could overwrite both setters to set the height as well as the width. But how would that affect client code? It is conceivable to have a client class that verifies the rectangle’s area and throws an exception if it is wrong. Of course we added the above method to our Rectangle class to provide the area. And we created a simple test by sending an empty rectangle object to area verifier and the test passes. If our Square class is correctly defined, sending it to the Client’s areaVerifier() should not break its functionality. After all, a Square is a Rectangle in all mathematical sense. But is our class? Testing it is very easy and it breaks big time. An exception is thrown to us when we run the test above. So, our Square class is not a Rectangle after all. It breaks the laws of geometry. It fails and it violates the Liskov Substitution Principle. I especially love this example because it not only violates LSP, it also demonstrates that object oriented programming is not about mapping real life to objects. Each object in our program must be an abstraction over a concept. If we try to map one-to-one real objects to programmed objects, we will almost always fail. LSP taught us why reality can not be represented as a one-to-one relation with programmed objects and how subtypes should respect their parents. We also put it in light of the other principles that we already knew. Defined by Robert C. Martin in his book Agile Software Development, Principles, Patterns, and Practices and later republished in the C# version of the book Agile Principles, Patterns, and Practices in C#, it is one of the five SOLID agile principles. What it states is very simple, however achieving that simplicity can be very tricky. A class should have only one reason to change. But why? Why is it so important to have only one reason for change? In statically typed and compiled languages, several reasons may lead to several, unwanted redeployments. If there are two different reasons to change, it is conceivable that two different teams may work on the same code for two different reasons. Each will have to deploy its solution, which in the case of a compiled language (like C++, C# or Java), may lead to incompatible modules with other teams or other parts of the application. Even though you may not use a compiled language, you may need to retest the same class or module for different reasons. This means more QA work, time, and effort. Determining the one single responsibility a class or module should have is much more complex than just looking at a checklist. For example, one clue to find our reasons for change is to analyze the audience for our class. The users of the application or system we develop who are served by a particular module will be the ones requesting changes to it. Those served will ask for change. Here are a couple of modules and their possible audiences. 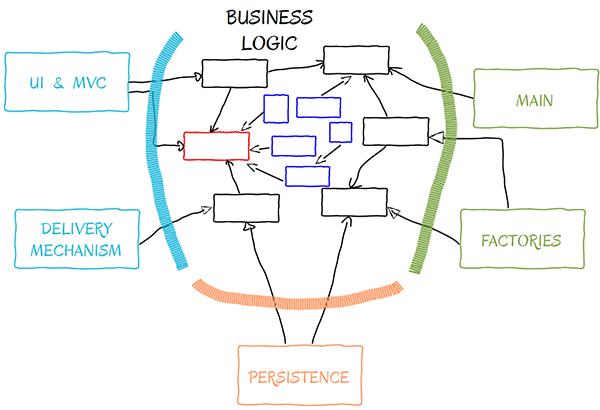 Persistence Module – Audience include DBAs and software architects. Reporting Module – Audience include clerks, accountants, and operations. Payment Computation Module for a Payroll System – Audience may include lawyers, managers, and accountants. Book Search Module for a Library Management System – Audience may include the librarian and/or the clients themselves. Associating concrete persons to all of these roles may be difficult. In a small company a single person may need to satisfy several roles while in a large company there may be several persons allocated to a single role. So it seems much more reasonable to think about the roles. But roles by themselves are quite difficult to define. What is a role? How do we find it? It is much easier to imagine actors doing those roles and associating our audience with those actors. So if our audience defines reasons for change, the actors define the audience. This greatly helps us to reduce the concept of concrete persons like “John the architect” to Architecture, or “Mary the referent” to Operations. In the sense of this reasoning, actors become a source of change for the family of functions that serves them. As their needs change, that specific family of functions must also change to accommodate their needs. Let’s say we have a Book class encapsulating the concept of a book and its functionalities. This may look like a reasonable class. We have book, it can provide its title, author and it can turn the page. Finally, it is also able to print the current page on the screen. But there is a little problem. If we think about the actors involved in operating the Book object, who might they be? We can easily think of two different actors here: Book Management (like the librarian) and Data Presentation Mechanism (like the way we want to deliver the content to the user – on-screen, graphical UI, text-only UI, maybe printing). These are two very different actors. Even this very basic example shows how separating presentation from business logic, and respecting SRP, gives great advantages in our design’s flexibility. A similar example to the one above is when an object can save and retrieve itself from presentation. We can, again identify several actors like Book Management System and Persistence. Whenever we want to change persistence, we need to change this class. Whenever we want to change how we get from one page to the next, we have to modify this class. There are several axis of change here. Moving the persistence operation to another class will clearly separate the responsibilities and we will be free to exchange persistence methods without affecting our Book class. For example implementing a DatabasePersistence class would be trivial and our business logic built around operations with books will not change. In my previous articles I frequently mentioned and presented the high level architectural schema that can be seen below. 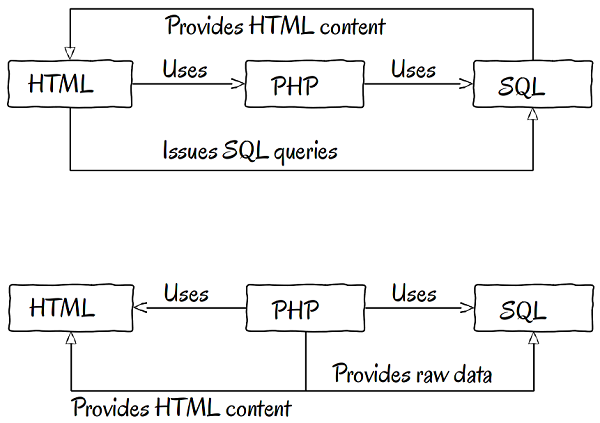 If we analyze this schema, you can see how the Single Responsibility Principle is respected. Object creation is separated on the right in Factories and the main entry point of our application, one actor one responsibility. Persistence is also taken care of at the bottom. A separate module for the separate responsibility. Finally, on the left, we have presentation or the delivery mechanism if you wish, in the form of an MVC or any other type of UI. SRP respected again. 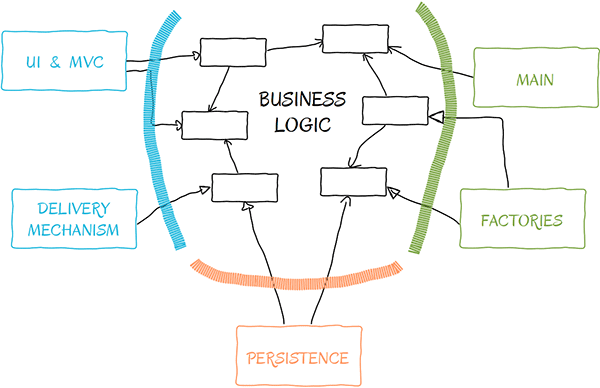 All that remains is to figure out what to do inside of our business logic. When we think about the software that we need to write, we can analyze many different aspects. For example, several requirements affecting the same class may represent an axis of change. This axes of change may be a clue for a single responsibility. There is a high probability that groups of requirements that are affecting the same group of functions will have reasons to change or be specified in the first place. The primary value of software is ease of change. The secondary is functionality, in the sense of satisfying as much requirements as possible, meeting the user’s needs. However, in order to achieve a high secondary value, a primary value is mandatory. To keep our primary value high, we must have a design that is easy to change, to extend, to accommodate new functionalities and to ensure that SRP is respected. High primary value leads in time to high secondary value. Secondary value means needs of the users. Needs of the users means needs of the actors. Needs of the actors determines the needs of changes of these actors. Needs of change of actors defines our responsibilities. Find and define the actors. Identify the responsibilities that serve those actors. Group our functions and classes so that each has only one allocated responsibility. Now this may appear perfectly reasonable. We have no method dealing with persistence, or presentation. We have our turnPage() functionality and a few methods to provide different information about the book. However, we may have a problem. To find out, we might want to analyze our application. The function getLocation() may be the problem. All of the methods of the Book class are about business logic. So our perspective must be from the business’s point of view. If our application is written to be used by real librarians who are searching for books and giving us a physical book, then SRP might be violated. We can reason that the actor operations are the ones interested in the methods getTitle(), getAuthor() and getLocation(). The clients may also have access to the application to select a book and read the first few pages to get an idea about the book and decide if they want it or not. So the actor readers may be interested in all the methods except getLocations(). An ordinary client doesn’t care where the book is kept in the library. The book will be handed over to the client by the librarian. So, we do indeed have a violation of SRP. Introducing the BookLocator, the librarian will be interested in the BookLocator. The client will be interested in the Book only. Of course, there are several ways to implement a BookLocator. It can use the author and title or a book object and get the required information from the Book. It always depends on our business. What is important is that if the library is changed, and the librarian will have to find books in a differently organized library, the Book object will not be affected. In the same way, if we decide to provide a pre-compiled summary to the readers instead of letting them browse the pages, that will not affect the librarian nor the process of finding the shelf the books sits on. However, if our business is to eliminate the librarian and create a self-service mechanism in our library, then we may consider that SRP is respected in our first example. The readers are our librarians also, they need to go and find the book themselves and then check it out at the automated system. This is also a possibility. What is important to remember here is that you must always consider your business carefully. The Single Responsibility Principle should always be considered when we write code. Class and module design is highly affected by it and it leads to a low coupled design with less and lighter dependencies. But as any coin, it has two faces. It is tempting to design from the beginning of our application with SRP in mind. It is also tempting to identify as many actors as we want or need. But this is actually dangerous – from a design point of view – to try and think of all the parties from the very beginning. Excessive SRP consideration can easily lead to premature optimization and instead of a better design, it may lead to a scattered one where the clear responsibilities of classes or modules may be hard to understand. So, whenever you observe that a class or module starts to change for different reasons, don’t hesitate, take the necessary steps to respect SRP, however don’t overdue it because premature optimization can easily trick you.